This is a set of two items from the television series "Xena: Warrior Princess." 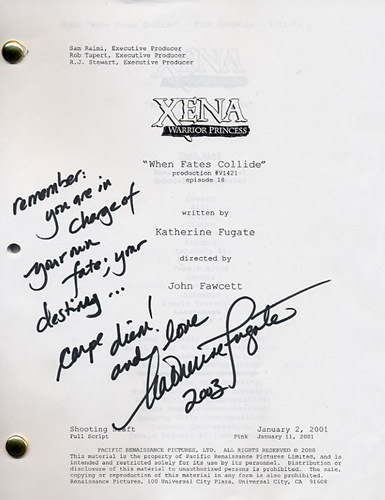 It includes a script of "When Fates Collide" autographed by writer Katherine Fugate and an 8x10 photo signed by Alexandra Tydings as Aphrodite. This script is the longer version with extra scenes not seen in the final edit. The script and photo come with a Certificate of Authenticity from the Official Gillian Anderson Website.